The Venus Table will be a versatile centerpiece for your modern living room. Pull it up near your favorite sofa for teas and snacks or decorate it with artwork. This table has a round glass top for a bright, contemporary appeal. From country to contemporary, this table effortlessly matches any room style. The round top shape is elegantly complemented by an urn-shaped pedestal. Available in other finishes. Engineered stone surface: Wash with mild soap and water avoiding wood surfaces. It's more elegant than I had Envisioned!! Love tge Heavy clear glass and the base gives it an elegant touch!! I'm just in love with my new table!!! Love the base. The glass is heavy and sturdy and it compliments the base giving it an elegant look to it. It has many different use to it. It took me a while to get it since it was out of stock but they were very much on point with the delivery. The delivery guys were awesome! They were very helpful and wouldn't leave until the table was nicely placed. Thank you!! Will continue to shop with you as well as recommend the store!! This is a great pedestal table! I LOVE it. 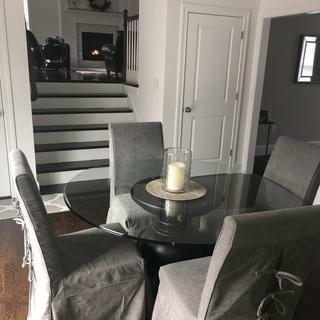 I bought the dark mahogany and paired it with grey parsons chairs. This table is classic and timeless. Jordan’s uniquely has this pedeatal style with the glass top. The price was outstanding. Plus they were able to deliver this in advance if the estimated date. Jordan’s has very professional and efficient delivery; I have purchased from Jordan’s before and have had excellent assistance each time on the sales floor, via the customer service phone staff and with the delivery personnel. Thank you!! Can I put a glass of 60 inch diameter on it? Yes, we also sell a 60" and 48" glass tabletop for this Pedestal Table. Please contact one of our retail stores for ordering information.